A few months ago we decided to buy a friend for our pet rat Benny. 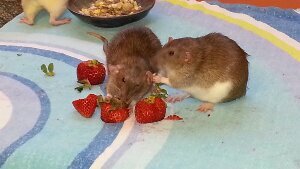 We wanted to buy a dumbo rat since Benny is a regular albino feeder rat, however, the pet store had two Dumbo rats and I just couldn’t split them up. 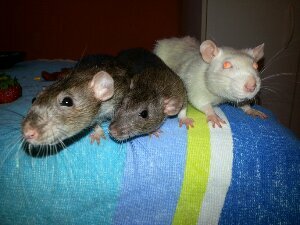 So we now have three pet rats- Benny, Olive, and Ash. You can see Olive and Ash in the above picture, with Benny’s cute little pink feet in the corner. What we didn’t anticipate was that Benny and our new ratty babies didn’t get along when they first met. 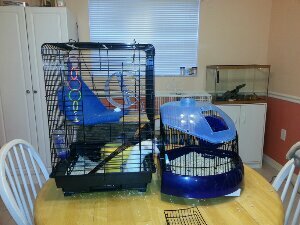 We found ourselves needing another cage from them as they were rapidly outgrowing the small pet playhouse they were living in. Coincidentally, my friend had an old bird cage that she was willing to sell me for $20. We ended up converting the bottom metal wired floor into a second floor and cutting part of it to form a ladder to the first floor so they could climb up. We fill the pull out tray at the bottom of the cage with bedding and it is really easy to clean up. Another advantage of the bird cage was that it had a door on the side that we propped open so that the ratty babies could travel from their new cage to their old playhouse and back. 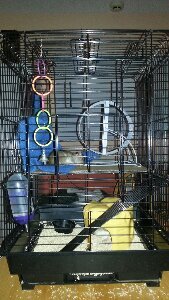 Now they have a whole Rat Condo and for $25 cheaper than the smallest rodent cage at the pet store. Fortunately, all of our rat babies now get along and they take turns all living together in the different cages.